Who is liable for compensating me if I was injured in a bus accident? Whether you are riding a bus to work, on a trip to another city, or on a charter bus tour, you can suffer catastrophic injuries in a bus accident. The dangers of you or a loved one being hurt is even greater due to the fact that many buses do not have seat belts and allow riders to stand while the bus is moving. Traumatic brain injury, paralysis, neck injuries, broken bones, and burns are just some of the serious injuries that are caused in bus accidents. Fortunately, you may be entitled to compensation for your medical bills, lost wages, and pain and suffering. However, you will need the assistance of an experienced bus accident attorney to determine who is liable for compensating you and to negotiate a fair settlement for you. Who Could Be Responsible for Compensating You in a Bus Accident? Bus driver. The bus driver’s negligence is often the cause of a bus accident. Speeding, driver fatigue, intoxication, distracted driving, and violations of basic traffic rules are common ways that bus drivers cause tragic accidents on city streets and highways. Bus company. The bus company may be liable for the negligent actions of its bus drivers under vicarious liability laws. In addition, the bus company could have engaged in its own negligent actions, such as failing to hire a qualified bus driver or requiring the bus driver to drive longer than allowed under federal law, which gives you another claim to hold the company liable for compensating you. If you were injured on a government-owned bus, special rules on the bus company’s liability and your duty to notify the governmental agency of your claim could apply. This is just one reason why contacting an experienced bus accident attorney as soon as possible is crucial. Tour company. If you were injured in a bus accident that you arranged through a tour company, you may have a claim against the tour company as well as the negligent bus driver and bus company. 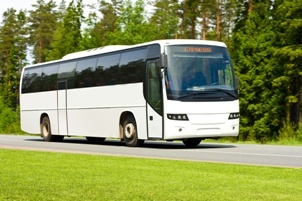 The tour company has a duty to hire a bus company that has a good safety record and uses competent drivers. The tour company could be liable if the bus company had a record of bus accidents or safety violations. If the tour company owned the bus, it could face similar responsibility for compensation. Maintenance company. In some cases, maintenance problems or manufacturer defects in parts, such as the brakes or tires, could cause the bus driver to lose control and cause a wreck even if he was driving carefully. Bus and tour companies have a duty to maintain safe buses and have them repaired as necessary. When maintenance problems are the cause of a wreck, the bus and tour company and a third-party maintenance company could face shared liability for the crash. You could also have a products liability claim against the parts manufacturer if this was the cause of your injuries. Other drivers. If another driver’s negligence was the cause of the bus accident, your claim would be against him. Determining the cause of your bus accident and who was at fault can be complicated. Our experienced bus accident attorneys are here to investigate your crash and negotiate your settlements. To learn more about your legal options, call our office today to schedule your free case evaluation.